I have two calculus classes, and one of them is deafeningly quiet. I know or have taught many of these kids before, and they are just a shy and reticent bunch. Enthusiasm and a lighthearted atmosphere has always worked in the past, as has groupwork, but not with these kids. I normally can break through this, but so far it’s still a little weird. Today, though, I had a glimmer of hope. Just a glimmer, but that was enough encouragement! Today, we were talking about average and instantaneous rate of change, and how these ideas relate to the slope of the secant and tangent lines. And of course I wanted to relate this to position/time graphs. I wanted my kids to see that having a position of an object was so… powerful. I always assumed that my kids in years past understood the awesomeness that came out of understanding that knowing the position at all times tells you the velocity at all times. That knowing information about the position of an object was giving us information about the motion of the object. Maybe to us this is obvious. It is an idea only truly half formed for them. They have an intuition about it, sure, but that’s about it. I really wanted to drive home the idea that we could see so much from a position versus time graph. and I ask them where the object is at various times. Then I say, let’s actually act this out. As I did this, all my students joined in by banging on their desks. (I didn’t ask them to.) They all put their hands up. They all joined in. It was a true glimmer of life! of community! For three BANGS we held our fist still, and then after three bangs, we moved it down to the desk and held it there for another bang, when all hands shot in the air and then stayed there for an extra bang. We acted it out. And then I said: let me tell you what makes calculus so powerful. 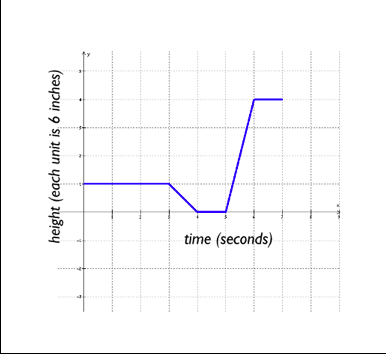 It allows us to look at this graph which gives us just the position an object — that’s all it gives us — and it lets us understand the MOTION of the object. What we have here is information about where the object is, but we now can find out how the object is moving. We could actually act out the MOTION of the object from that. It seems so obvious, but the connection is so deep. I’m building the concepts here. We do the math later. Pre-emptive footnote: Yes, we had a discussion about how this graph could not actually be representing something in the world, because of the sharp edges. What a cool experience! I really like how you made such a cerebral concept so physical. This is obviously not calculus-related, but today I was working on measuring angles with a fifth grader and, completely unprompted, he stood up, turned 90 degrees, turned another 90 degrees, and then sat down and draw the angle he needed to draw (200 degrees… he needed to estimate what 180 degrees felt like first). I think it’s easy to forget to use our bodies to learn math, and it’s so cool when we stumble on a good way to do it!